Tokyo-based Terumo Corporation is one of the world's leading medical device manufacturers with $4.95 billion* in sales and operations in more than 160 nations. 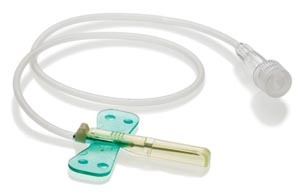 Founded in 1921, the company develops, manufactures and distributes world-class medical devices including a broad array of syringes, hypodermic needles, catheters, winged infusion and blood collection products for hospital and physician office use, and state-of-the-art products for use in cardiothoracic surgery, interventional procedures, and transfusion medicine. *Please note the manufacturer only provides a stock image for this product group. The product appearance may be different. The specific product details are listed in the description.